Amazon UK Confirms PS4 Gap Over Xbox One is "Quite a Big One"
Amazon UK's Ketu Patel claims the Xbox One has a "lot of catching up to do" to the PS4, and thinks Titanfall will help close that gap. Following yesterday's news that the PlayStation 4 version of Tomb Raider:Definitive Edition sold more than twice compared to its Xbox One counterpart in the UK, Online retailer Amazon UK's "category leader of videogames and software" Ketu Patel weighs in on the next-gen console war. While the exec applauds Microsoft for snatching exclusivity with EA's Titanfall, and calls it a "big coup," he states that the PS4 gap over the Xbox One in terms of sales is "quite a big one," and that Microsoft has "lots of catching up to do." 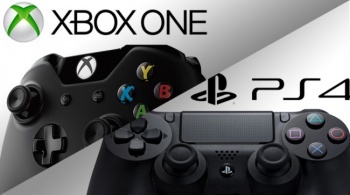 On the hardware front and how it performs on its online storefront, Patel notes that the PS4 is still the company's number one best seller, while the Xbox One is somewhere in the top five, and based on that, "obviously one console has outperformed the other." If you look at our bestsellers chart PS4 always has been, and still is, our number one best seller...Xbox One will fall somewhere within the top five. Obviously one console has outperformed the other generally and we probably confirm that split between the two. While the PS4 outselling the Xbox One is not really groundbreaking news by now, Microsoft's console is far from being a flop, either. Sales-wise, is this a case of people being loyal to the PlayStation brand, or mostly due to word of mouth that the PS4 is the technically superior console out of the two?